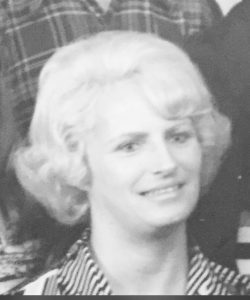 Carol M. Yule, 76, of Merrimack, NH died Saturday Feb. 4, 2017 at her home surrounded by her family. She was born in New Haven, CT on Dec. 25, 1940, a daughter of the late Howard T. and Mary F. (Evans) Coates. Carol has been a resident of Merrimack since 1970 and was a communicant of Our Lady of Mercy Church. Before retirement, she was employed as an office manager for the Merrimack Police Dept for many years. She is the widow of Burton Yule who died in 2009 and is also pre-deceased by a brother David Sundmacker and two sisters, Shirley Coates and Lillian Rooks. Members of her family include a son Michael Cheslock of Elkton, MD; three daughters, Theresa Cheslock and Sara Warner both of Merrimack, and Dawn Ladd of New Port Richey, FL; two step-sons, Jeffrey Yule of Merrimack, and Mark Yule of Wilmington, VT; 14 Grandchildren; 12 Great-grandchildren; three brothers, Howard Coates, and Richard and Thomas Sundmacker; three sisters, Joan Squeglia, Barbara Trasocco, and Edith Neely; and many nieces and nephews. Calling hours were in the Rivet Funeral Home & Crematorium, 425 Daniel Webster Hwy, Merrimack on Wednesday Feb. 8, 2017 from 5-8 PM. A memorial mass was celebrated in Our Lady of Mercy Church, 16 Baboosic Lake Rd, Merrimack, NH on Thursday at 9:30 AM. Burial followed in Last Rest Cemetery, Merrimack, NH. Those who wish may make memorial contributions to the American Cancer Society. For more info or to sign an online memorial book, go to rivetfuneralhome.com.